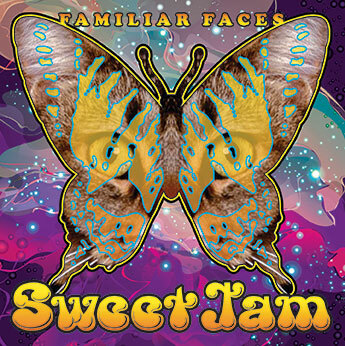 "Familiar Faces" is Sweet Jam's second cd and again features original songs written by Mark McFadden, which are often described as "heart rock". The songs have positive lyrics layered over rock, jazzy and dreamy chord changes. Through our music, Sweet Jam strives to bring a message of hope and peace to our often choatic and violent world. As well, we have added our version of Sky Saxon and The Seed's "Summer of Love" song, which we are very honored to have included on the soon to be released, also through GRA, Sky Saxon Tribute cd - http://www.skysaxon.com/SkyTributeAlbum.html. Legendary drummer, Prairie Prince (The Tubes/Todd Rundgren/Jefferson Starship/Quicksilver Messenger Service) added his awesome chops on this song for us! In 2012, just before Sweet Jam was to perform at the Monterey 45 Years Later Festival on September 29th, which was held at the Monterey County Fairgrounds, site of the original Monterey Pop, we heard of the passing of Scott McKenzie. Therefore, in his honor, we played our version of his iconic "San Francisco" song - written by John Phillips - and also included it on this cd. The cd artwork was designed by renowned poster artist, Dennis Loren, who has been creating unique, beautiful and collectible posters for many years for Moonalice, Big Brother & The Holding Co., Moby Grape/Jerry Miller Band, Jefferson Starship, Frank Zappa, and many more. Once again, we thank Karl Anderson for including our new cd on his wonderful label! May the Sweet Vibe of Sweet Jam spread Love & Peace to All!